These fantastic 770L 4 wheeled bins without lockable lids are excellent for outside waste storage needs. At 770L they have a large capacity for waste, making them perfect for businesses like Cinemas or general retail stores. The 4 castors allow them to be moved effortlessly, their measurements are H 1360 x W 1350 x D 770 mm. The material they are made of is strong and hard-wearing UV stabilised polyethylene giving them a longer life and preventing them from fading through exposure to sunlight. The use of this material is beneficial as it makes the bins extremely impact resistant, meaning they won't be easily damaged. The lid not being lockable is advantageous as it will allow for fast waste disposal, which is ideal for any busy industry. 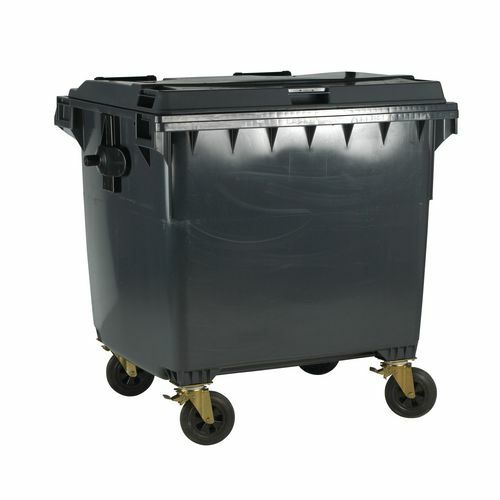 The bins come with a 12 month guarantee, they are available in blue, green, grey or yellow.